Do Rising Oil Prices Threaten the Economic Recovery? HomeBusinessDo Rising Oil Prices Threaten the Economic Recovery? Ten of the 11 recessions in the United States since World War II have been preceded by a sharp increase in the price of crude petroleum. Oil had been holding around $80/barrel over the last month, but traded as high as $87 last week, leading the Financial Times to ask whether oil could give the “kiss of death to recovery.” Here is how I would answer that question. 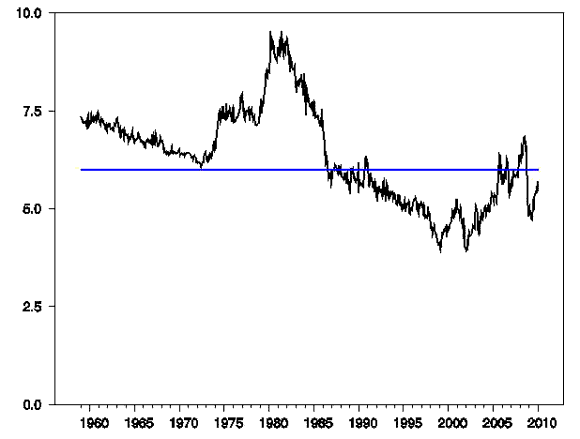 100 times the natural logarithm of the producer price index for crude petroleum with U.S. recessions indicated by shaded regions, 1971:M1 to 2010:M2. Americans buy a little less than 12 billion gallons of gasoline in a typical month. With gas prices now about a dollar per gallon higher than they were a year ago, that leaves consumers with $12 billion less to spend each month on other things than they had in January of 2009. On the other hand, the U.S. average gas price is still more than a dollar below its peak in July of 2008. Changes of this size can certainly provide a measurable drag or boost to consumer spending, but are not enough by themselves to cause a recession. 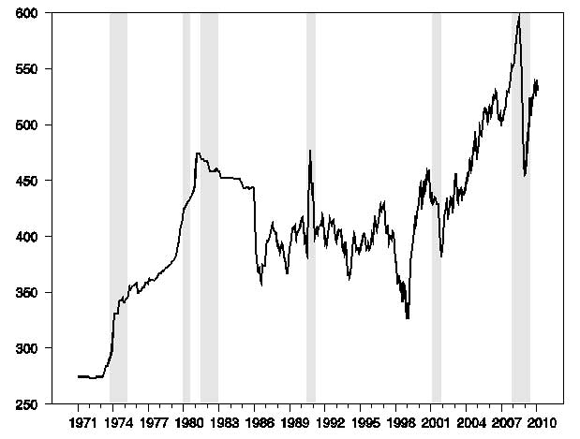 Average U.S. retail price of gasoline (dollars per gallon). Source: NewJerseyGasPrices.com. Domestic Days’ Supply of Selected Vehicle Segments. Source: Ramey and Vine (2010). 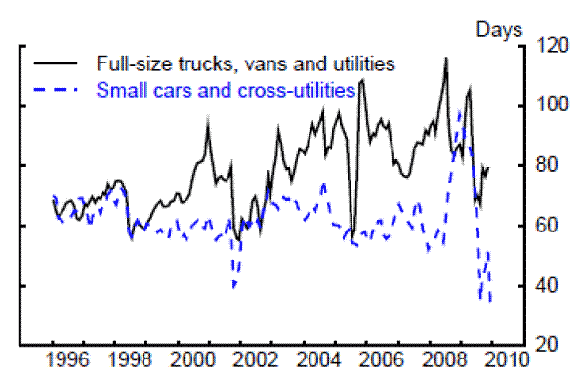 If these spending shifts are indeed an important part of the transmission mechanism, we would expect the economy to respond to changes in oil prices according to a nonlinear relation. A rise in oil prices may induce some consumers to postpone purchasing a car, but a fall in oil prices does not lead them to go out and buy two new ones. Moreover, an oil price decline can induce some other sectoral adjustments such as layoffs for those who work in the oil industry. I’ve recently completed a paper reviewing some of the academic literature in which I conclude that the empirical evidence for a nonlinear response is pretty compelling. I’ve shared before with Econbrowser readers (, ) the results if you use a particular nonlinear model that I first published in 2003 to forecast what real GDP would have done after 2007:Q3 conditional on knowing the subsequent path of oil prices. Here’s an update on how that forecast is doing when you match it up with the actual values for GDP that we saw in 2009:Q4. The downturn was more severe than could be attributed solely to the oil shock of 2007-2008, but that shock appears to have been an important contributing factor, and the overall path followed by GDP up to this point is very similar to the 2-year-ahead prediction. Note that according to this model, the economic growth now being observed is not due to the decline in oil prices after 2008:Q2, but is instead simply a result of a normal cyclical recovery as the economy eventually works through the adjustments to the initial shock. Solid line: 100 times the natural log of real GDP. Dotted line: dynamic forecast (1- to 9-quarters ahead) based on coefficients of univariate AR(4) estimated 1949:Q2 to 2001:Q3 and applied to GDP data through 2007:Q3. Dashed line: dynamic conditional forecast (1- to 9-quarters ahead) based on coefficients reported in equation (3.8) in Hamilton (2003) (which was estimated over 1949:Q2 to 2001:Q3) applied to GDP data through 2007:Q3 and conditioning on the ex-post realizations of the net oil price increase measure. According to the relation that generated the above forecast, we wouldn’t have to worry about another oil shock until the oil price series in the top figure gets back above the values of 2008:M6 or until the 2008 highs recede farther into memory. I’m not comfortable taking that particular functional form too literally. As I noted in my original paper, lots of alternative nonlinear functional forms could also fit the historical data about as well. But I do have doubts that the mechanisms that were a factor in the first half of 2008 could operate with the same force in the current environment. 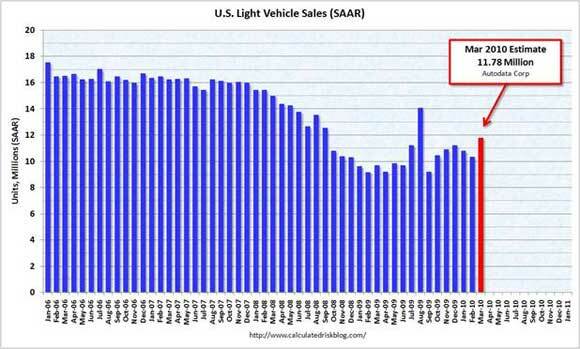 I’m doubtful of a renewed plunge in light vehicle sales, in part because the levels are still so low and so many purchases are still being postponed. And with retail gasoline prices still a dollar a gallon below what consumers have recently seen, I’m doubtful that gasoline prices have the ability to induce as much consumer anxiety as we observed two years ago. Although recent increases in prices have brought energy expenditures back up as a share of total consumer spending, they’re still below the 6% level at which consumers historically have started to make dramatic adjustments. Energy expenditures as a fraction of consumer spending. Calculated as 100 times nominal monthly consumption expenditures on energy goods and services divided by total personal consumption expenditures. Data source: BEA Table 2.3.5U, “Personal Consumption Expenditures by Major Type of Product and Expenditure,” obtained from Econstats. Dashed line is drawn at 6.0%. So to return to the question posed at the beginning: $87 oil is certainly not helping the recovery. But I would be very surprised if it proves to be the kiss of death.